Is the foot in the crotch really necessary? 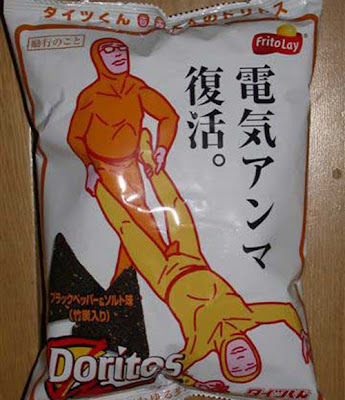 The bigger question is , why the hell are they on the bag at all? What's with the body suit things? and... yeah WTF? The guy in yellow looks like he's enjoying it. WTF, Japan. Seriously. Doritos! They're crotch stompingly good! Well, it says "Denki Anma Fukkatsu", which means Electric Massage Revival. The Electric Massage is a kinda old Japanese... um... attack, I guess. The picture is self-explanatory. The crotch stomp, lol, it probably means the orange guy is making the guy feel good = improved taste or sth. So, basically you're eating 2 guys doing that for each chip.